Trade along the Ancient Silk Road can be traced back to historical times when land and sea routes between China and Europe were vibrant with the movement of a range of goods including silk, spices, precious stones, etc., as well as cultural exchanges. Sri Lanka too played an active role in the ancient Silk route of the ocean. Situated strategically in the middle of the ancient Silk route of the ocean between East and West, Sri Lanka functioned as an entreport of trade for exchanging commodities. Archaeological excavations in many parts of Sri Lanka have unearthed large hordes of Roman and Chinese coins, which indicate that merchants from West and East met in Sri Lanka and exchanged wares. Potential trade and economic gains from greater connectivity along the Silk Road have resulted in various efforts to revive the ancient Silk Road. Efforts of UK and France to connect South Asia, South East Asia, and Far East during colonial times and more recently, the ‘Asian Highway’ proposed by Economic and Social Commission for Asia and the Pacific (ESCAP) are some initiatives taken to develop intra-Asian and Euro-Asian connectivity. More recently, China aims to reclaim the past glory of the ancient Silk Road through its own One Belt One Road initiative and it is one of the boldest initiatives taken by China since becoming the second largest economy in the world. OBOR initiative was first announced during Chinese President, Xi Jinping’s visit to Central Asia and Southeast Asia in 2013. 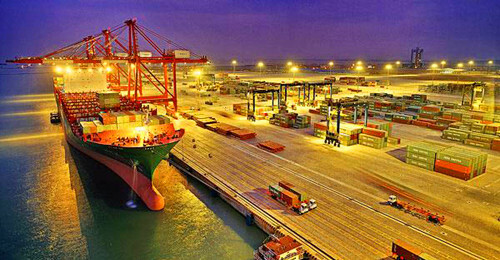 Subsequently, the document Vision and Actions on Jointly Building Silk Road Economic Belt and 21st-Century Maritime Silk Road, released in March 2015 outlined that OBOR and its aims to connect Asian, European and African continents and strengthen partnerships among the countries along the Belt and Road towards promoting diversified, independent, balanced, and sustainable development. OBOR includes both land and sea routes. The land route called The Silk Road Economic Belt focuses on bringing together China, Central Asia, Russia, and Europe (the Baltic). This includes linking China with the Persian Gulf and the Mediterranean Sea through Central Asia and West Asia whilst connecting China with Southeast Asia, South Asia, and the Indian Ocean. The Belt would be complemented by the sea route, called the 21st-Century Maritime Silk Road, which would stretch from China’s coast to Africa and Europe via the South China Sea and the Indian Ocean in one direction, and to the South Pacific in the other direction. OBOR initiative includes five key cooperation priorities: policy coordination, connectivity, unimpeded trade, financial integration, and people-to-people bonds. OBOR aims to achieve ‘Policy Coordination’ through Inter-governmental cooperation on macro policies and strengthen ‘Connectivity’ between the three continents through soft infrastructure ranging from customs cooperation to trade and investment cooperation. ‘Financial integration’ will be achieved through joint efforts to establish the AIIB and BRICS New Development Bank, signing of MOUs on cooperation in bilateral financial regulation, establishing an efficient regulation coordination mechanism in the region, etc. Promoting cultural and academic exchanges, personnel exchanges and cooperation, media cooperation, youth and women exchanges and volunteer services, tourism promotion, etc., are suggested as means of enhancing ‘People-to-people bond’. China’s enthusiasm and active promotion of OBOR is reflected in the recent upturn of trade and economic ties between China and partner countries. China’s trade with countries along the Maritime Silk Road has been growing at an average of 18.2 per cent annually over the past decade, and accounts for 20 per cent of the country’s total foreign trade volume. Chinese direct investments in OBOR countries increased from US$ 240 million to US$ 9.27 billion during the past decade, representing annual growth of 44 per cent. So far, a number of projects have been embarked as part of the OBOR initiative. For example, the first cargo train from China to Iran, known as the Silk Road Train, arrived in Teheran in February 2016 after a 14 day journey travelling a distance of 10,399 kilometers through Kazakhstan and Turkmenistan fromChina’s Eastern Zhejiang province. China’s efforts to restore the ancient silk route in South Asia include the US$ 46 billion China-Pakistan Economic Corridor (CPEC) linking Kashgar to Gwadar; Bangladesh-China, India, Myanmar Economic Corridor (BCIM) and the US$ 1.5 billion Colombo Port City Project in Sri Lanka, amongst others. Other key initiatives include Chinese investment in Central Europe such as the China-Belarus Industrial Park, a special economic zone in the Republic of Belarus; signing of 33 deals in Kazakhstan, amounting to US$ 23.6 billion covering mining, engineering, processing, transport, oil, gas, etc. The establishment of the Asian Infrastructure Investment Bank (AIIB), a multilateral development bank of the 21st century, is another significant development. AIIB, launched with 50 signatories, will focus on the development of infrastructure and other productive sectors in Asia, including energy and power, transportation and telecommunications, rural infrastructure and agriculture development, water supply and sanitation, environmental protection, urban development, and logistics. Launched with an initial capitalization of US$ 100 billion, AIIB is expected to lend up to US$ 10 billion-US$ 15 billion a year for the first five or six years and approve about US$ 1.2 billion of financing in 2016 to fund related infrastructure projects. OBOR initiative has raised suspicions on China’s intentions behind the ambitious plan. Some observers have viewed it as China’s Marshall Plan, aimed at addressing its growing excess capacity issue, especially in the construction sector. Nevertheless, the initiative has been hailed by others for its potential to stimulate Asian and global economic growth. Despite its ability to contribute to Asia’s reemergence in a changing economic order, several grey areas around the initiative remain. First, more clarity is needed on the exact parameters of the initiative and the exact mechanism of achieving the stated priorities. Cooperation priorities are broad in scope and cover a range of critical activities. However, a more detailed account of how these broad activities will be undertaken at national, regional, inter-governmental levels is yet to be spelt out. Second, there are concerns regarding the initiative developing into a formal binding agreement at some point in time. Proliferation of mega-regional trade agreements with binding commitments have got observers curious of how OBOR will function in this context. Regional Comprehensive Economic Partnership (RCEP) could help in this regard but has thus far shown slow progress. Without a binding commitments or a formal coordinating body, the implementation and more importantly the monitoring of the initiative, could prove to be difficult. Third, despite the initiative encompassing five broad policy priorities, existing efforts so far have been geared towards enhancing infrastructure connectivity, while others have been given relatively less prominence. Fourth and needless to say, the success of the initiative will depend by and large on geo- political factors. India’s security concerns in relation to China’s activities in the Indian Ocean Region (IOR), rising military tensions in the South China Sea and President Obama’s Asian pivot policy basically intended to maintain US hegemony in the region are factors at play. Mutual recognition and trust, which has been stressed by China to be at the center of OBOR, will be important in addressing some of the challenges at hand. Sri Lanka’s strategic position in the middle of the maritime Silk Road offers the opportunity of promoting the country as a trading hub in the Indian Ocean. It is with this view that the Government has pledged to support China’s OBOR initiative. Sri Lanka’s relations with its second largest trading partner, China, have been improving over the years. Linked closely with the OBOR initiative, China has invested in developing Sri Lanka’s infrastructure and has emerged as one of Sri Lanka’s top 5 investors. Latching on to the OBOR initiative could further improve trade and investment linkages with China and other OBOR partner countries including East Asia and Europe. However, there is still very little awareness of the initiative in Sri Lanka. So far, the country’s experience with OBOR has been strongly linked to infrastructure connectivity, with less emphasis given to other priority areas of cooperation. Though OBOR appears to be promising, the lack of a detailed plan makes it difficult to capitalize on the initiative fully and assess its long-term benefits and implications for the country. Going forward, Sri Lanka will benefit from greater information on the OBOR to determine how best the initiative can be translated into concrete outcomes for the country in the years to come.